It is with great sadness that we announce the passing of Jessie Thomson on February 9, 2019 at the Crowsnest Pass Continuing Care Centre, Blairmore, AB. She was 90 years of age. Jessie was born in Poland on June 20, 1928, and immigrated to Canada with her family as a young child. In October 2017, she relocated from British Columbia to the Crowsnest Pass. Throughout her life, Jessie enjoyed many activities including crocheting, gardening and landscaping, and she loved to dance. She also spent countless happy hours playing cards – especially with her grandchildren. 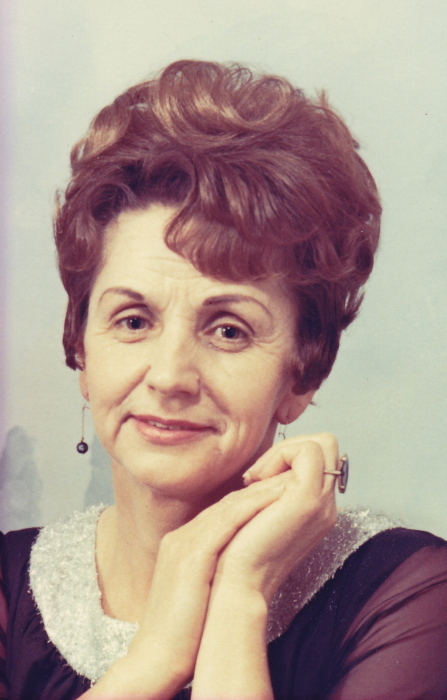 Jessie was well known for her delicious Ukrainian and Polish dishes and for her homemade wine. Nothing brought her more pleasure than taking care of her family and time spent with them. She will be deeply missed and fondly remembered by all who knew her. Left to mourn her passing and celebrate her life is her daughter, Julie Meyer; her daughter-in-law, Janet Feldberg; her grandchildren, Susan (Ryan) Ronald and family, Berny (Lane) Haukedal and family, Anita Plummer and family, Crystal Plummer and family, and Greg (Amy) Plummer and family; twenty great grandchildren; and her brother Rudy (Vi) Konkolus. She was predeceased by her parents, Joseph and Kathryn Konkolus; her son, Kenneth Feldberg; her brothers, Ed, Mike and Victor; and her sister, Jenny. With respect for Jessie’s wishes, no funeral service will be held. In lieu of flowers, memorial donations will be gratefully accepted by the Crowsnest Pass Health Foundation “Continuing Care” (PO Box 455, Blairmore, AB T0K 0E0). Condolences may be registered at www.fantinsfuneralchapel.ca.